There's a road called 'Sidings Lane' off Coventry Lane which would seem to indicate that there were a load of sidings there. (For coal traffic I would imagine). I'm not sure whether the book is a commercial release. It might just be only available from Bramcote History Group. Alan and Graham Crisp did a really thorough job of digging up so many documents on the area. I've seen this road Sidings Lane. Isn't it that little stub for parking near the canal? There are new(ish) houses across the road and this is the site of what used to be Izzards Roses. I wonder what that place was built upon. Here's yer answer. Coventry Lane across the right corner. And because I know that map isn't very clear, here's the zoomed in version. 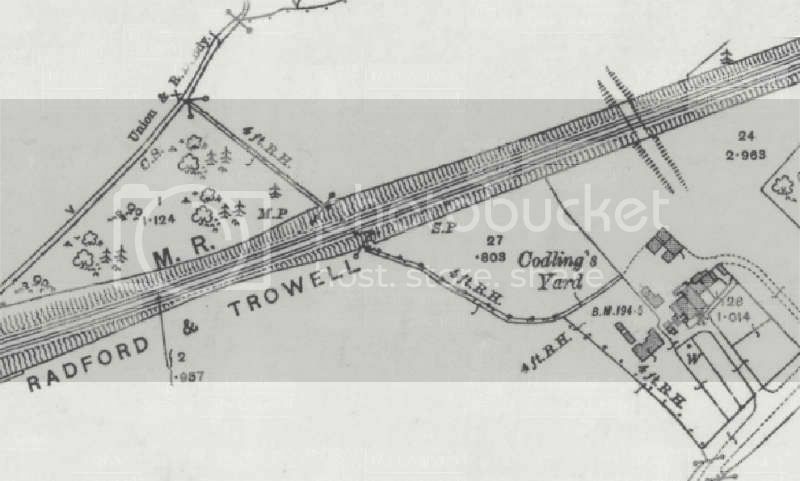 It shows one of the private railways going into a yard named after Mr Codling who probably owned it. No. I'm talking about the other side of Coventry Lane. In the Apex of Moor Lane and Coventry Lane. I used to deliver their milk, and then went on to the cottage across the road from BIS and then those houses on the corner of Ilkeston Road. That was when we also did Ballon Wood Flats. "Huntingdon chose the start of his waggonway route to coincide with the point where the Parishes of Strelley, Bilborough and Wollaton join together; it actually sits astride two of the boundarys (Strelley and Bilborough) the rails cross the boundary into Wollaton. From this point it is a gentle downhill route, making it easier for the horses when loaded. The other end of the route was at a coal collection point for Tumbills and Waynes on the Wollaton Road." Thanks for that very interesting piece of info. Given that I used to spend lots of time on Old Coach Road as a youngster, it is mindboggling that this may have been where the first recorded railway passed. I would like to return to the topic of the cutting through the sandstone on Moor Lane Bramcote and why was it made? 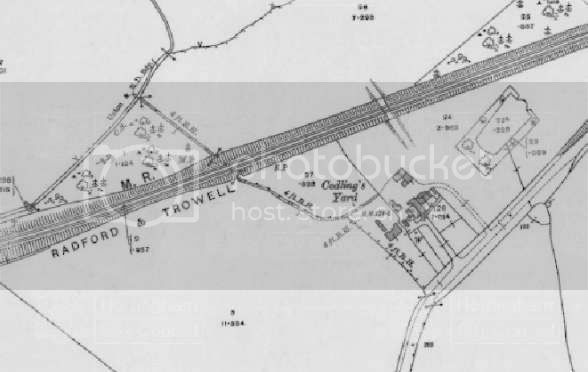 Perhaps, looking at old maps of the area I think it is safe to assume that Moor Lane cutting was there before the Nottingham Canal and therefore before the railway. The cutting must have been made by paid labour or but by enforced labour by which I can only assume would be connected to the Napoleonic Wars. However if so this would have been after the Canal so I have to assume that it was made by "paid" labour and can conclude that it must have had an industrial reason for its being. Could it have been a form of "tramway" (horse drawn). Could it have been cut out about the time of the horse drawn railway on Old Coach Road Wollaton , reputed to be the oldest in the world. Without a doubt there are connections to the Willoughby Family and coal mining. An old map shows a "Tramway" at Balloon Plantation crossing Coventry Lane and going up to Spring Farm more than likely on the line of the road which goes up to Spring Farm now. This could have extended through to Moor Lane, through the cutting , over to Bridle Road and in a direct line through to the navigable River Trent. Being before the canals the River would have been the only way to transport coal other than by horse drawn overland routes often impassable. My belief is that it could well have been related way back to the time of the origin of coal mining i.e bell pits. The earliest bell pits were near Cossall on the soon to be Opencast Mine. There were also numerous pits of the same nature opening up around Trowell Moor and the Wollaton area. Transportation of any coal had to be overland horse drawn (and difficult). Wooden rails would have been an option. If you look at a gradient map then if you go south from Balloon Plantation , encompassing Trowel mining , then if a cutting was made on Moor Lane then there is an almost continual downhill route to the River Trent. Later, when canals were built to carry the coal, there was a Engine House Colliery at the junction of the Nottingham Canal and Moor Lane . Why was it there? Could it have been to take advantage of Moor Lane before the Canal was built? My belief is that the Moor Lane Cutting was created because of the need to haul coal to the Trent. Possible it was created in the early 18th century. Has anyone any further thoughts? BTW the attached photo is from the Moor Lane Canal junction not as headed. I don't know if you've seen some of the earlier posts, but Bramcote History Group did some research into Bramcote Moor and the Moor Lane cut-through. I believe they intended to collate all the information into a book. Their belief was that Sempringham Priory (who owned the estate - including the moor from the 12th. Century) cut the road through for 2 reasons. One was to provide easier access to the moor because of the coal deposits and the fact that it was valuable grazing land, the other was that they needed a large amount of sandstone for building work elsewhere. When it was done is hard to say, but it's obviously hundreds of years ago. The sandstone theory is a possibility but why a cutting that is of the width of a " tramway"? Surely if sandstone was required it would have been hewn in a random fashion? It would also have been more easily available in many other locations. I still feel that coal is the catalyst and coal transport is the reason for the cutting, either in the early 18th or 17th century. I found your forum through searches for info on Bramcote Moor Lane cut-through (posted 2011) and 6 years later I don't think we are any the wiser. The con- census then was that the roadway had to be cut through to level the gradient for horse and cart transport of coal and such to the turnpike road (A52) at Bramcote . It was said that the mineral rights belonged to the Willoughbys of Wollaton Hall and so supposedly they claimed the excavated stone. Perhaps they needed a local source for building stone and this cut-through solved two aims ??? May I return to an old question and that refers to the cutting on Moor Lane Bramcote. When was it made and to what purpose? Again mining is thought to be involved and a possible gravity railroad connecting the nearby canal to the Trent and Mersey Canal in Beeston. Does anyone have any old photos ?